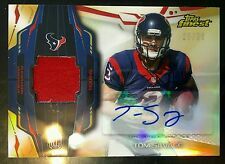 2014 TOPPS MUSEUM TOM SAVAGE RC 3CLR QUAD JERSEY TEXANS #3/150 1/1! JERSEY #3! JERSEY #3! Card is in NM-MT condition or better. 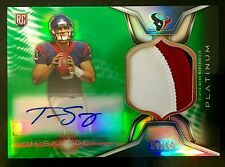 UP FOR SALE IS A... 2014 Platinum #ARP-TS Tom Savage Autograph 3 Color Patch Green Refractor RC 59/99 of the Houston Texans BONUS 1 Free Bonus Is: 1. 2014 Platinum Purple Refractor Rc #61/75 Please see scan for exact condition. Card has been stored in a penny sleeve and toploader and kept away from the light. Only taken out of protection to be pictured so you can see any imperfections when buying. Card will be shipped in a toploader and team bag packaged securely inside of a bubble mailer shipped via USPS. 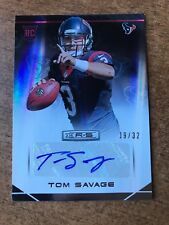 UP FOR SALE IS A... 2014 Finest #RAP-TS Tom Savage Autograph Patch Gold Refractor RC 26/50 of the Houston Texans BONUS 1 Free Bonus Is: 1. 2014 Rookies and Stars Crusades Refractor RC Please see scan for exact condition. Card has been stored in a penny sleeve and toploader and kept away from the light. Only taken out of protection to be pictured so you can see any imperfections when buying. Card will be shipped in a toploader and team bag packaged securely inside of a bubble mailer shipped via USPS. The card is a patch card with 2 colors. Card is in a penny sleeve and top loader. Card is serial 40/75. TOM SAVAGE. TOM SAVAGE is taking over the Houston Texans team as the Starting QB. He will be the cornerstone with unlimited potential. Rookie Autograph Patch Rookie Card. The 3-color Patch Autograph Card has card number of RAP-TS, in Gem Mint Condition with 8 sharp corners front and back. Tom Savage / Houston Texans. Sports Cards (All sports). U.S. & World Coins & Currency.